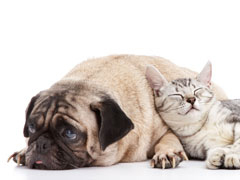 We have a variety of different health care team members that provide service to you and your pet. Ranging from client services representatives to registered veterinary technicians, from veterinary assistants to kennel techs /attendants, and from veterinarians to Practice Manager groomers, each person is thoroughly trained to handle your needs and those of your pet. Some of these positions require college training and licensure, such as a veterinarian or veterinary technician. This is the equivalent of a nurse in a medical office or hospital. Even those who are not college trained receive extensive on-the-job training, and all team members are required to attend in-house team meetings and training sessions as well as off-site continuing education seminars. We're here to help you and your pets, so please don't hesitate to ask us questions, we're happy to answer any questions you may have. Our team members and especially Dr. Hans are willing to provide seminars to any organization on an availability basis. We are often seen at various 4-H, scouting, or school groups doing anything from career discussions to demonstrations on pet care or training, often with a few furry friends in tow. If your group is interested is scheduling a demonstration or hospital tour, please contact our office manager, Robin. You may also meet a student observer, high school intern, or volunteer when you are here. We try to make ourselves available to people who want a chance to see "behind the scene" activity to help them decide about careers in veterinary medicine. Sometimes we will also have veterinary students (called externs) doing part of their school work at our hospital. If you want information on employment opportunities, click on "Other Features" at the left, then "Employment." Send us a resume to keep on file! Practice Administrator: Robin S. Hood joined the New Carlisle team in June of 2016 after moving back to the South Bend area from Texas to be closer to family here. She brings with her 19 years of veterinary experience in both technical/medical and business administration and management of veterinary practices. She attended Oklahoma State University and is a former professional golfer, having played on the LPGA Tour for 10 years. For many years she has fostered dogs for rescue organizations to be their bridge to a better life and a permanent home. Her hobbies include photography, golf, DIY projects and spending time with family/friends. She shares her heart and home with her partner and their dogs and cats. Caprice Moore has been employed since 1992 as a client services representative. Before coming to us, she had 7 years' prior experience in other veterinary clinics. She has 2 daughters, and is "owned" by her Australian Shepherd and cats. She enjoys camping, being a 4-H leader, and reading. Rose Bozyk joined us in 2007 as a client services representative. 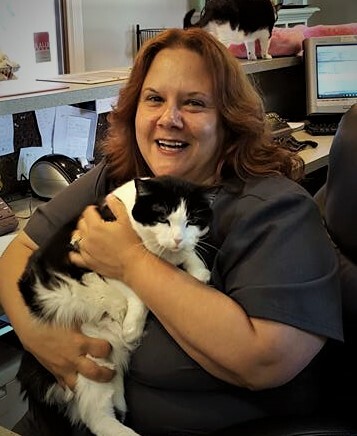 Prior to that, she brought with her 22 years of experience as a receptionist at a veterinary hospital in Chicago but decided to move out of the city to the great town of New Carlisle due to a job transfer of her husband. She enjoys her 5 Chihuahuas, 2 cats, and is a great cook! Rose also has spent a lot of time rescuing animals, fostering dogs and preparing them for a second chance at a new and better life. Brooke Hicks is one of our client services representatives and joined us in July of 2018. She came to us with veterinary experience and has quickly become a wonderful addition to our team. She has a big smile and a big heart for people and animals. She is married with 2 young children and has 1 dog. Amy Snyder came to us in 2005 as a job-trained technician, she is a long time employee and one of the leaders of our Technician team. Prior to coming to us, she had over 15 years' experience in the veterinary field, starting as a kennel attendant. She is married with lots of four legged kids, including a dog, 4 cats, 2 rats, and 4 turtles. She also has a two legged kid too..... a daughter! She enjoys reading, fishing, and the outdoors, and loves dolphins and pugs. Kari O'Donnell, RVT Graduated from Brown Mackie College 2010 and is a Registered Veterinary Technician. 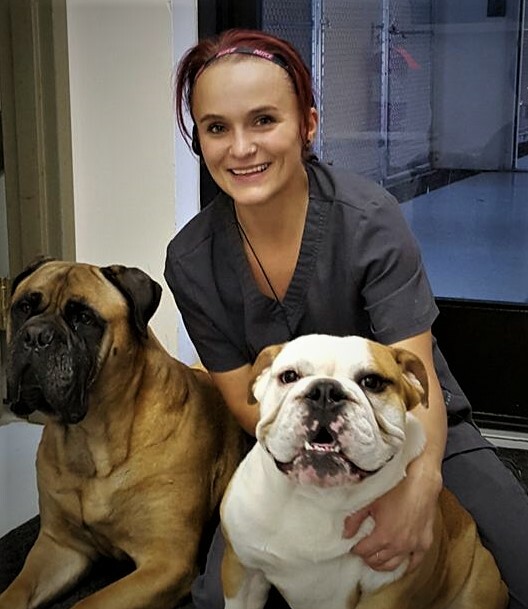 She has a special interest in orthopedic surgery assisting and loves client education to help give people a better understanding of veterinary medicine and preventive care. She lives with her husband 2 dogs and 4 cats. Kari enjoys reading, Star Wars and music. Ashley Deforest, RVT. Ashley join the NCAC team in September of 2016 and came to us as a Registered Veterinary Technician with over 5 years of experience. She graduated from Brown Mackie college in 2011. She enjoys all aspects of her work but has a special affinity for our feline friends and feline nutrition. She was married in the fall of 2017 and she and her husband Dustin share their home with 2 cats and a dog. Chelsie Jaybar, RVT joined the practice in March 2013. She is a graduate of the Veterinary Technician Institute of International Business College. She recently passed her state licensure examination and is now a Registered Veterinary Technician. Chelsie was married in 2016 and currently has 2 cats, 1 dog and a horse. She enjoys camping, horseback riding, and crafts in her free time. Stephanie Herrbach, RVT is a Registered Veterinarian Technician. Stephanie Graduated from Michigan State University in 2007. She is married with 1 young son and a daughter. She moved to the Three Oaks area in 2012. She loves Siamese cats, and she currently has 2 cats and one is a Siamese. Paige McGinnis is one of our new assistants having joined our team in August of 2018. She has brought with her a passion for animal care and learning the latest medical techniques. She is excited to be part of a wonderful team of technicians and assistants and to learn from. She shares her home with 3 dogs and she also has a horse. She has a high drive to help people and animals and has a special interest in client education. Tiffany Cooper is a kennel assistant/groomer and has been with us since October 2006. She is the backbone and leader of our kennel team. She has also graduated from grooming school and has been grooming for several years. She was married in the summer of 2018 and is shown here with her 2 dogs Skye and Moose. She enjoys concerts and loves Elton John! Kourtney Keck is one of our kennel assistants and joined our team in September of 2018. She brings with her a solid work ethic and big heart for the animals in her care. She lives right here in New Carlisle and has 2 dogs, 2 cats and 2 parakeets. She has also fostered dogs and cats to help them prepare for their new home. Welcome Kourtney! We're so happy to have you join our team! Melissa Florian is one of our kennel assistants. She worked here originally 10 years ago and just recently re-joined our team! We're so happy to have her back, she now has a new baby boy. She's been involved with 4H for 19 years and raises cattle and pigs.